Optimism, mutual respect and appreciation, flows in the relationship of an Aquarius and an Aries. They make a very exciting and friendly combination, giving each other a lot of space and enjoying their personal freedom as well. 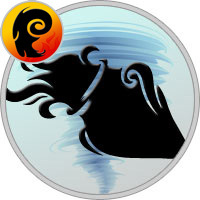 Though Aries may find Aquarius to be insensitive at times and that can be problematic at times. Remembering the mythological archetypes of this couple can be revealing. Aries, the Hero, wants to be loved and worshipped for his or her actions and bravery, which the ram likes to think are born of lofty ideals but which can actually be quite self serving. Aquarius, the Visionary, abhors selfishness, and wants to respected for his or her ideas – but isn’t honestly that bothered about being loved for them, and often struggles to put those ideas into practice in any case. The Visionary will tell the truth, even when it hurts, and will remain calm and distant while doing so. Aries the Hero, known for bluntness, will tell the truth too, but with added temper and fire. Where Aquarius and Aries compatibility runs into trouble is that each sign’s truth is very different to the other. If they are truly in love, and can resolve those very different approaches to life, they can do marvellous things together, but it’s a big ask for both signs. Aquarius and Aries do share a powerful common characteristic. When ready, they completely commit themselves with a strong curiosity to activities or ideas. They do so until they have completely drained the fun or have learned the experience it has to offer. With these two, there is no dwelling over the past. These two have a definite purpose in helping in each others lives. If examined properly they learn that one of them is always willing to help the other. With this, the other must learn to be grateful and use this gift. The challenge for the Aquarius and Aries is to learn this truth, and the earlier the better. Otherwise, the opposite can occur. If Aquarius and Aries cannot accept their life bond, then they might continue living life relationship to relationship, always falling hard and never utilizing the powers that can connect these two forever. Aquarius and Aries are very compatible. There is a bond that keeps then in harmony as one helps the other. Even in bitter disagreement these two can stop everything and make it better and be in harmony again. Aquarius is built to handle Aries and their impulsive behaviors. Another reason for compatibility is that these two feel misunderstood by the world. And for this allow Aquarius and Aries to back each other up and pick each other up when the world comes knocking at the door. Due to their highly motivated and passionate endeavors, they find great successes through accomplishments and career. The Aries, being the risk taker may fall a bit, but the Aquarius strives to keep them on the right path. There is the potential here for a full, healthy and exciting interaction with these two. Though they are generally compatible but still they have to face some minor problems. Aries maybe too impulsive for the free flowing soul of Aquarian making them feel uncomfortable. While sometimes Aries need real display of love which Aquarian neither find logical nor do they know to demonstrate it. This can crush the heart of Aries and make them feel empty. Aires’ hot tempers and Aquarian’s need of freedom can create some undefined distances between these two. But by understanding and utilizing each others strengths, Aquarius and Aries can have a wonderful journey of life ahead of them that never grows old and is enriched with exciting adventures and experiences. If one thing is for sure, these two never run in place for too long. Instead, they are the force that inspires others to live a full life. They live a full life, achieving many things together. The Aquarius and Aries can do well with one another. Aquarius male marries the Aries female because of her pure innocence which wins his heart in the very first meeting. She is a perfect match for him who understands him like no one else. She always supports him and makes him feel comfortable even in the tough phases of life. She keeps doing something to keep their relation fresh and vivacious. She admires his adventurous soul and his relaxed nature. He also adores his lady and always keeps her secure and safe in his arms. When he is around, she knows she doesn’t need to worry. He is a very understanding match for the Aries woman as he fulfills all her demands without complains. He brings smile to her face by surrendering his heart to his love. He finds his lady irresistible and always feels attracted to her vibrant personality. They are a passionate couple and once they get committed to each other, they take all possible steps to make it the most beautiful relationship with their constant efforts. Their relationship blooms with fragrances of love, romance, passion and affection. They make it a wonderful and colorful association with their unconditional love which survives the toughest times and keeps getting stronger with time.